We are very proud to announce that Dr. Forrest Ringold and Surgical Association of Mobile, in partnership with Mobile Infirmary Medical Center, have been chosen by Intuitive Surgical, the leader in Robotic Bariatric and General Surgery Solutions, to be an Epicenter for Robotic Bariatric Surgery. While many hospitals around the country have invested in robotic technology, Dr. Ringold and Surgical Association of Mobile have been leaders in the deployment the new technology both in General and Bariatric surgery. Our practice is one of the first in the Southeast to make wide-scale use of the Robotic Platform, known as the da Vinci Surgical System, for weight loss and other general surgeries. Being designated an Epicenter for Robotic Bariatric Surgery illustrates the expertise that Dr. Ringold and the entire team here at SAMPA have amassed over the years. Surgeons from around the country will be coming to our facility to observe procedures and learn more about Robotic Surgical Technology. Robotic Bariatric Surgery is truly a transformative technology, making many complex procedures more routine. Wristed Instruments, with an even greater range of motion than the human wrist, can access parts of the abdomen that simply cannot be reached with traditional laparoscopic tools. The Surgeon can see the surgical field with amazing precision and excellent clarity thanks to a three-dimensional view from a specially made dual lens camera/laparoscope. 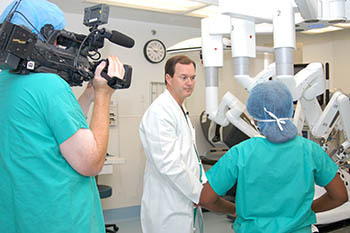 Further, the Surgeon can control all Robotic Arms while seated at the Ergonomic Console just a few feet away. At SAMPA, we believe that the combination of improved dexterity, 3D visualization, precision and better ergonomics lead to better outcomes for qualifying patients as well as reducing fatigue for the surgeon. 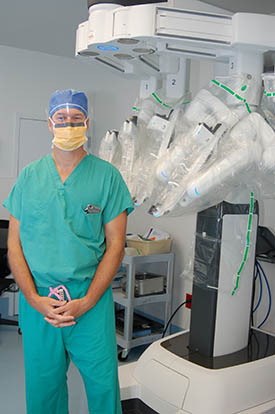 In one of his first roles as a Robotic Bariatric Epicenter Surgeon, Dr. Ringold will be speaking in Sunnyvale, California this May to a group of 25 Surgeons interested in honing their techniques and learning more about Robotic Bariatric Surgery. Topics will include the outlook for Robotic Surgery and its applications as well as demonstration of the 4th Generation (Most Advanced) Robotic Technology – All 3 of Mobile Infirmary’s Robotic Systems are 4th Generation. To learn more about Robotic Bariatric Surgery and how it may be advantageous to you, we encourage you to call our office or drop us a line. We are always happy to see new patients and recommend the very best, safest and most effective option for them.